Charlotte Restaurant Week really lets you get a bang for your buck. I’m getting too accustomed to these upscale, three-course meals in such fine-dining establishments! I should probably change my blog to “Cooking at Home with Amanda,” but I digress… If you can squeeze in a reservation to Aria Tuscan Grill in Uptown Charlotte before the Queen’s Feast is over, do it. The restaurant sits across the street from the Omni Hotel, and the dining room is below street level. The architecture is aesthetically pleasing, with a stairwell leading down to a vast seating area, a glass cabinet displaying a huge wine selection, and abstract décor adorning the walls. I always love a restaurant that lets you have a view into the kitchen, too. I’m a red wine fan, but I also enjoy the occasional bubble, and if you’re in the same boat as me, have I got a wine for you! I had Lambrusco for the first time last week and fell in love. It’s the best of both worlds – a sparkling, chilled red wine. The Medici Ermete Lambrusco Solo was a spectacular start to the meal. Warm ciabatta bread and a chunky white bean and onion relish was brought to the table. This was an interesting, yet tasty change from the usual Olive Oil dip (which was also on the table) and I should have avoided eating so much of it since I had three courses coming! Caramelized Gnocchi featured pillow-like potato dumplings, with a scrumptious gorgonzola and truffle oil sauce. Everything is better with truffle oil. It’s like ice cream on peach cobbler, avocado on your burger – it’s culinary gold. Prosciutto added a salty bite to the dish, and julienned pears added crunch, though the sweetness was unrecognizable against the strong gorgonzola flavor. I sampled a slice of my companion’s Wild Mushroom Pizza (a large serving) with goat cheese, caramelized onion, arugula and more of that yummy truffle oil. The goat cheese was salty and creamy, a standout against typical mozzarella. This was a tasty oil-based pizza. I went out of my comfort zone for a protein I had never tried, and it won me over. Slow Cooked Veal Risotto was rich and delectable, and I cleaned my plate. Large chunks of veal were served in a succulent red wine sauce with perfectly cooked risotto, pine nuts for texture, alongside Roasted Bone Marrow. I’ve had bone marrow once before, and it has a soft and almost slimy texture, though it has great flavor from being roasted in the bone. Anytime meat is cooked on the bone, it’s extremely tender and flavorful. The dish was topped with celery leaves, and though I’m not the biggest fan of celery, the sharp and bitter flavor provided nice contrast to the creamy sauce. 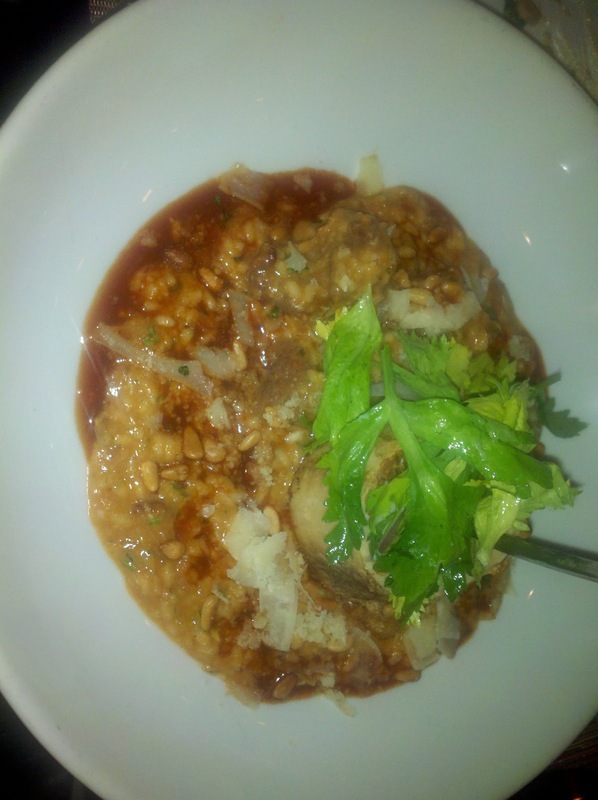 Overall, the dish was a beautiful blending of flavors, and I appreciate the fact that the risotto was not undercooked, as it oftentimes gets stuck in your teeth...not okay. Roasted Butternut Squash Ravioli was served in a lovely, nutty browned butter sauce, alongside small bites of spicy sausage and wilted greens. Browned butter is on the same level as truffle oil – it just takes the flavor up a few notches. (Ever tried browned butter cream cheese frosting? Out of this world.) The sausage bites were so small that I thought it was bacon at first, and the butternut squash filling played between sweet and savory notes. A splendid dish. Dessert finally arrived, and of course I made room for a few bites. Mascarpone Cheesecake was complemented with a strawberry sauce that tasted fresh, obviously not from a plastic bottle. Mascarpone is a savory, creamy cheese (very similar to cream cheese) so this made for a really fluffy cheesecake. It’s hard to mess up this classic dessert, but the use of mascarpone was a noticeable and fantastic choice. Chocolate Hazelnut Cake is definitely a chocolate-lover’s dream. The chocolate cake itself wasn’t too sweet, but layers of hazelnut gelato and chocolate ganache made for a rich dessert. Toasted hazelnuts on top provided a nice crunch, and it was almost like eating Nutella in cake form! A scoop of strawberry gelato was served on the side oddly enough, but this fruity cream broke up the chocolate flavor nicely. Aria transported me to beautiful Tuscany with wonderful modern Italian cuisine, and provided an attractive atmosphere as well. You’ll absolutely get your $30 worth if you come here for Restaurant Week - which ends tomorrow, so hurry and make your reservations!